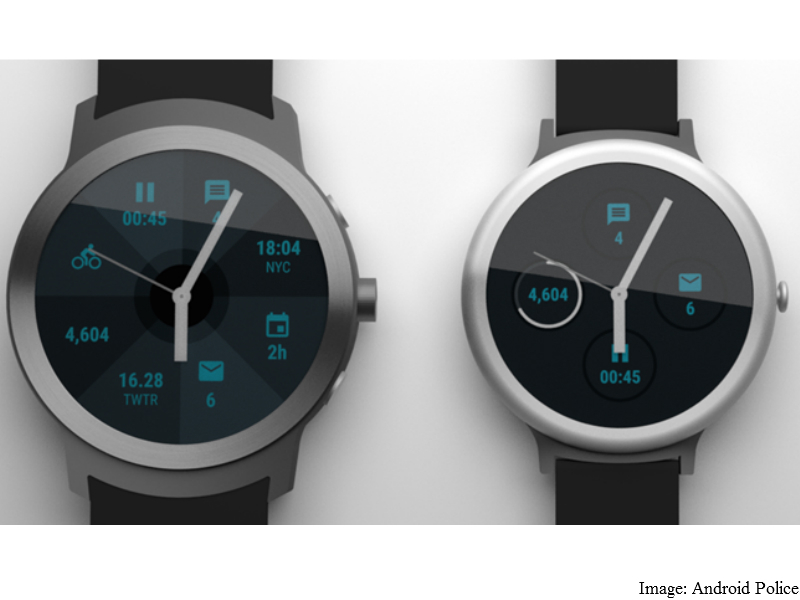 Last week, reports of Google making two of its own Android Wear smartwaches surfaced online, and now leaked images of the two wearables have made their way to the Web. The previous report tipped that the two smartwatches have been codenamed Angelfish and Swordfish, and are expected to launch after the Nexus devices in fall this year. The images have been leaked by Android Police, and it warns that the smartwatches have been recreated, in order to keep the source anonymous. The report asserts that the image is an ‘accurate representation’ of the leak, however it does not guarantee that the final product may look the same. Angelfish is the high-end variant of the two smartwatches, and will be significantly larger and thicker than the Swordfish variant. The build includes a distinct crown button on the left, with small shoulder button on top and bottom. The display dons the customisable watchface of Android Wear 2.0 demoed at Google I/O this year. Apparently, Angelfish will not be compatible with Android Wear Mode watch bands i.e. no removable straps. The smartwatch will come with cellular connectivity (support GPS and LTE) to have the capacity to run standalone without pairing with a smartphone. Swordfish is a significantly smaller smartwatch, with a single button protruding to the left. The report states that Google has tried to tackle the flat-tyre design issue by incorporating a thick bezel between the display and ring, making the display screen much smaller. There is a black gap before the display begins, which effectively removes Motorola’s flat tyre design, but makes the display look much small. Swordfish will be compatible with Android Wear Mode watch bands. It will not support GPS and LTE, and may not even include a heart rate monitor. There is no word on the branding of these smartwatches. Whether Google is calling it Nexus, Pixel, or even just Google is not yet known. The pricing, exact availability, or technical spec details also remain undisclosed. In any case, we recommend that you take all of this with a pinch of salt, until Google releases official word.